Kentucky Fried Chicken is a fast food institution. Colonel Harland Sanders first started serving his fried chicken recipe in 1930 in a roadside gas station. Maybe that's where the phrase "eat here, get gas" comes from. He opened his first restaurant in 1952 and quickly expanded. Saunders sold his franchising operation in 1964 and it passed through several owners until PepsiCo took it over in 1986 and spun it off under the Yum Brands banner in the late 1990s. Sanders remained as the primary spokesman for KFC until he died in 1980. Even after his death his image remains a central component of the firms advertising. I remember eating Kentucky Fried Chicken as a kid. It was always a treat because it was a nice change from homemade meatloaf and tuna casserole (with peas - but that's another story). 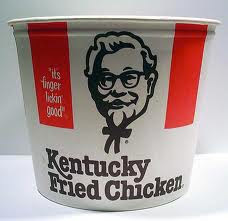 And besides, unlike anything else I ever ate, this stuff really was "finger lickin' good". As an adult, though, I've steered clear of KFC ever since I read that story that KFC was actually KFD - Kentucky Fried Dog. Okay, maybe I dreamed it. But no more. Nope. KFC has announced it's dispensing with the slogan "finger lickin' good" because it wants to change its negative nutritional image. Hell, they don't have to change their slogan. They just have to get rid of their caloric crispy cancer plop on a plate, the Double Down. KFC intends to go with the new slogan "So Good". Yeah, like James Brown isn't rolling over in his grave. I wonder if his family will get any royalties. Voulez Vous Manger Poulet Ce Soir? Do You Like Our Buns? Then, again, after having watched the following commercial maybe it's time for a change. I like your slogans. The voulez vous made me laugh REAL hard. But they are all definitely chuckle worthy. Does that make you a chucklehead? IWBY: That was a cool ad. I wonder who sand the jingle. Almost sounds like the Easybeats. Quirks: Oh, I'm fuckle chuckle good! Sometimes. "Fuckit, Get The Bucket" - Ha! My sentiments exactly, especially when I don't feel like cooking. I've only had KFC once in my entire life, and that was while my sister and I were on vacation and needed something really unhealthy after a run-in with a huge cockroach. I remember it was the best chicken I had ever had. Then we forgot were we had it and spent the rest of our vacation searching for KFC. I have never had the pleasure of KFC. Not once, not ever, and I never will. My husband eats it. I don't understand men. 00dozo: Has a nice ring to it, doesn't it? Ziva: I think the word to underline in your comment is "cockroach". I thought my dream was about Kentucky Fried Dog but it could have been Kentucky Fried Cockroach. Linda: But it's finger lickin' good. The Colonel taught us how to eat without utensils. How can you pass that by? Oh, yeah, that'd be a man thing. But black people will still eat it. "There's only one way to make chicken -- my way." "If you want Kentucky Fried Chicken you have to visit me." The Expert: Thanks for your insightful comment. cardiogirl: Control freak? I had an uneasy feeling with that little girl sitting in his lap. You couldn't run that commercial these days. I haven't had KFC in years. I think they changed the Colonel's secret recipe. Maybe they stopped using Beagles and started using Poodles? We only got KFC as a treat when we'd head out for a picnic with the family, and every single time I ate that crap I'd spend the night barfing it back up. Do these fast food places REALLY think they can change their images? I mean really, it's freaking FRIED chicken! Nicky: You mean it wasn't a dream? Ugh. sheila: You know it's funny how you can hardly tell them apart these days. Burger places sell chicken. Chicken places sell burgers. They're all trying to be everything to everybody. And they're succeeding. They're ALL awful. This is definitely a case of over-thinking something. 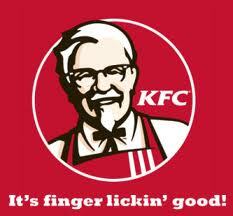 What's wrong with "finger lickin' good"? Sure has a better ring to it than, "Chow Down on Our Chicken Then Be Sure to Wash Your Hands". Chris: Yeah go finger, erm, ah, figure. I love fried chicken, even KFC's. The best is Popeye's, but I also love Church's. The very best is the stuff I make using Craig Claiborne's family recipe. Mike:I'm going off of chicken. Last week Canadian Border guards discovered spoiled chicken being smuggled into Canada. You just never know what's in what you're eating these days or where it came from. Let the "why did the chicken cross the border" jokes begin. I am definitely a member of the "I love fried chicken" crowd. KFC, BOJ, etc. There's even a local place called "Mountain Fried Chicken" that's pretty good. KFC was a treat when I was a kid. My favorite is the original recipe. The seasoning is good! Linda: I loved the stuff when I was a kid. But I didn't like it when they went crispy. It just wasn't the same.